Beauty products are a tricky one when it comes to testing and reviewing: I say no to 99% of brands who ask me to trial their ‘miracle creams that will make me younger and change my life’ (I’m 22, and I’m also pretty sure a cream won’t fix all my existential issues). Plus, I am not about to mess up my skin by trialling different creams and potions every week. According to my lovely beautician friend, that’s the recipe for an acne disaster. With this in mind, I make sure to grill brands whenever they contact me, and I don’t settle for anything but honesty. In this messy world of ‘influencing’ and ‘blogging’, I spend a lot of time weaselling out the truth from the BS, and when I find people who lack any type of BS too: I stick to them like glue. Agnes & Me are my kinda people. Agnes & Me is a natural and handmade skincare company, founded by ex-nurse Deirdre. She’s a fire cracker of a woman, passionate about natural skincare in a way that is oh so contagious, you’ll wish you had the pleasure of drinking tea with her too. 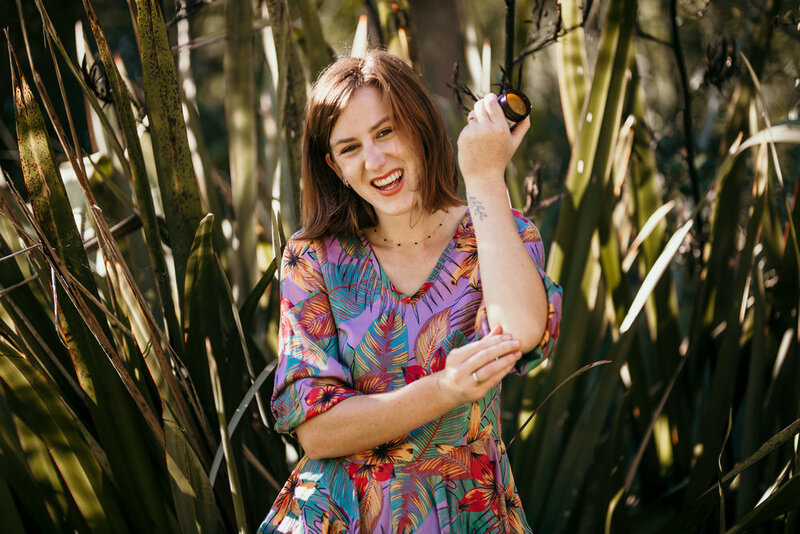 Deirdre makes her products (right here in Auckland) with precision and skill, but spends equal time researching, investigating, trialling, and pondering how to best care for skin types of all kinds. Have you ever met a brand owner who will deny you a purchase, because they don’t think you need it? That’s Deirdre. She’s a minimalist when it comes to her own beauty care regime, and after personally trialling products from the range, it’s clear she’s implemented minimalism into the Agnes & Me products too. If you don’t need it: don’t buy it. That’s her policy, and if you walk up to her stall at a market and try to buy a face oil mindlessly, you might be turned away if it’s not a product Deirdre thinks will suit your skin and be worth your money. Agnes & Me products are made in glass (dark brown glass to increase the lifespan of the product) and metal containers. They include only the highest quality natural ingredients, and ingredients are organic whenever possible too. When you browse through the Agnes & Me online store, you’ll find a mix of masks, creams, lip balms, and lotions. Not only is it a HOOT to say, but the Blam Blam Balm is really a minimalists dream. The uses are endless: dry skin, sunburn, bee stings, makeup remover, face moisturiser, hair smoother, hair conditioner, lip balm, and cuticle repairer. It smells like a beeswax lavender heaven, and I am very impressed with it’s secure lid for travelling too. New on the block, the Agnes & Me face oil is nutrient rich and full of the good stuff, including anti-oxidants galore and omega-rich oils. It’s the type of oil you want to rub all over your body, but stop yourself, because you never want the bottle to end. My favourite scent I can smell as I rub it on my face, is the macadamia oil. Upon further research, I realise it’s the perfect thing to stop flakiness and dry skin in the winter! Perfect for this time of year. This cream is the best example for ‘a little goes a long way’. Only a very little pea size is needed to cover your whole face. It’s a fab moisturiser to put on morning or night, under makeup or without. The floral scent is present, but not too overpowering. To be honest, its not my favourite scent as I prefer more neutral smells for a daily product, but for you floral lovers, this is your go-to. WARNING: Only buy these products if you need them. If you want to know more about if they will work for you, contact Agnes & Me directly. If you do want to buy, use code ETHICALLYKATE to make your purchase easier with 10% off. Shop the Agnes & Me Natural Skincare range here.